User: Charles A. Ord & Minnett. Address: 13-15 O'Connell St, Sydney, NSW. Revenue Use: Numeral 3d, 6d, 9d, 1/-, 2/-, 3/-, 5/-, 10/-, 20/-. Rarity Scale: Numeral 3d R3, 6d R3, 9d R4, 1/- R3, 2/- R4, 3/- R4, 5/- R4, 10/- R4, 20/- R4. Background: Charles Ord left a senior position in the Bank of New South Wales and bought a seat on the Sydney Stock Exchange in 1949 and in 1951 he joined with Jack Minnett to form the broking firm, Ord and Minnett. Charles Ord and Jack Minnett knew each other professionally but there friendship was based mainly on the time they spent together while serving in the Australian Army during World War Two. The next three decades saw the business grow steadily, initially through positioning themselves to provide the London Stock Market access to Australian shares. Later the firm was involved in the establishment of investment trusts, in particular in the Australian mining industry. This in turn led to the establishment of more general funds management organisations. The company was involved in some key company floats including Pioneer Sugar Mills and Lend Lease Corporation before expanding further into merchant banking, initially in partnership, and later in joint venture with Bankers Trust in the company which became Ord-BT. In 1960 Ord Minnett acquired A W Harvey Lowe & Co and in 1964 they acquired the long established firm of T J Thompson and Sons and the combined company became Ord, Minnett, T J Thompson and Partners until 1976 when it was renamed Ord Minnett. 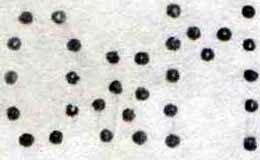 Device: The O&M.a device was located in Sydney and the resulting O&M.a pattern is found on revenue stamps of NSW, where it is numbered O&M.b, see Device section of the O&M.a pattern in the NSW section for an explanation of this anomaly. 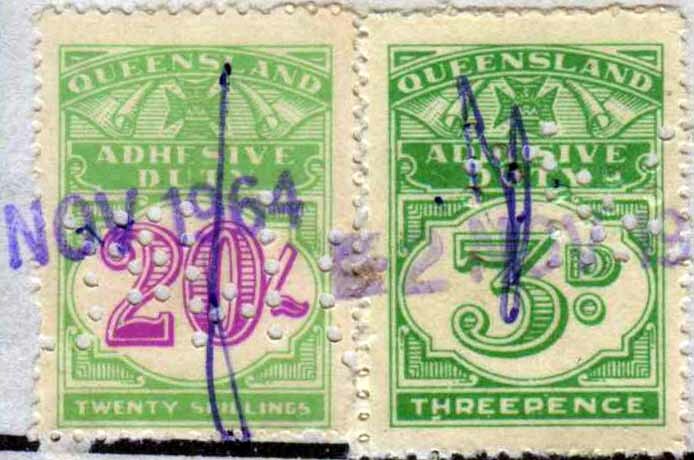 But the O&M.a pattern is also found on the revenue stamps of Queensland, Victoria, South and Western Australia, where it is numbered O&M.a. Evidence from Share Transfer documents indicates that transactions from all States were handled through Ord and Minnett’s Sydney office at O’Connell Street. This suggests that the revenue stamps were sourced from each State and sent to Sydney for perforation and subsequent use. This was also the practice of other Sydney based Stock broking firms such as Constable and Co and A D Meares and Bishop. The O&M.a device seems to have been a single die device, but the authors have examples of close horizontal multiple strikes that show consistent separation between pattern strikes. This would normally indicate a multi die device but there is much evidence for a single die device as well. Most multiples show random separation and further the pattern is found as a single horizontal centrally located strike on the large format Victorian £10 revenue which would not be possible with a multi die device with close dies with separation to suit the NSW numeral series. Most likely the device had a single die.